This sections covers loss of color underwater, color compensation that your brain does, understanding color temperature, and reflected light. What color disappears first underwater? Water absorbs different wavelengths of light to different degrees. The longest wavelengths, with the lowest energy, are absorbed first. Red is the first to be absorbed, followed by orange & yellow. The colors disappear underwater in the same order as they appear in the color spectrum. Even water at 5ft depth will have a noticeable loss of red. For this reason, strobes are usually used to add color back to subjects. Don't forget to add in the horizontal distance. If you are 10ft underwater, and you are viewing an object 10ft away, the light has actually travelled 20ft, and all of the reds will be filtered out. Likewise, if you light up an object with your strobes 5ft away, the light has to travel 5ft to the object, and 5ft back to your lens, for a total of 10ft, with a significant loss of reds. This is why you always need to get close to your subject. Read more about getting better color in your underwater photos. Since we are talking about water, I should note that objects can appear up to 25% closer underwater than they actually are. Objects will also appear to be up to 33% larger than they are. This is due to the fact that the index of refraction of water is greater than air. 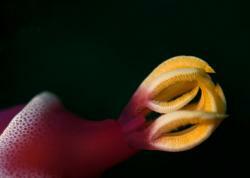 This happens behind flat surfaces, such as your mask, a compact camera underwater housing, or a macro port. It does not happen when using a dome port. Your brain will compensate for the loss of color underwater. This is why you still think you can see reds and oranges in deeper water, but when you take an ambient light shot with your camera, they aren't there! Light is often referred to having a certain color temperature. 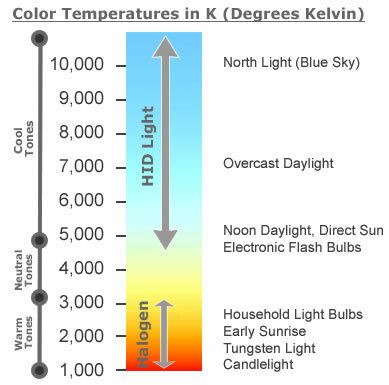 Strangely, warm light is a lower color temp, and cool light, blue, is a higher color temp. The amount of light that penetrates the surface depends on surface conditions, the weather, and the time of day. Choppy waters reflect more light than calm waters. Sunlight from the horizon is reflected much more than sunlight from straight above. The brightest conditions underwater will occur on a sunny day, with a calm surface between 10AM and 2PM. Light penetrating the surface early in the morning and late in the day has a soft quality and can be great light for underwater photography, just like it is for topside photos.